You are here: Home / Blog / Uncategorized / Self efficacy – A well used term but well understood? Self efficacy is a term banded around in therapy quite regularly at the moment especially as more active approaches to rehabilitation are being embraced. So we have to ask exactly what does it mean, why does it matter and how do we improve it? In fact my twitter friend/colleague Jerry Durham asked me this question whilst I was in the process of writing this blog, talk about great timing! It also shows that we often don’t have a well defined definition for a well used term. Lets start with what does it mean? It was a term first coined by Bandura in the 70’s, he described it is the 'belief of an individual on whether they have the ability to perform behaviours relative to a specific activity'. Self efficacy has also been described as a ‘resilient self belief system’. I like to describe it as a sense that ‘I have got this’ or ‘I can do this”. This could be self efficacy in relation to pain, such as the perception of the ability to remain functional and perform activities of daily living whilst you have pain, or it could be treatment related activities such as a specific activity or exercise. So lets say that your kind therapist has suggested that you go to for a walk to help out with your back pain, do you think that you will be capable of doing this? Maybe you don’t feel motivated? Perhaps you don’t feel confident that you physically can? Could be that you feel you can’t fit it into your busy life? Low self efficacy may result in challenges, such as changes in behaviour, being seen a threats to be avoided rather than things that can be overcome. Bandura identified a number of psychological process involved with self efficacy, these being cognitive, motivational and affective (emotional). Having valued goals and activities appears to be a associated with these factors as well and self efficacy and resilience literature points towards valued activities being an important part of this process HERE. Bandura also identified four main sources of self efficacy. Previous mastery of an activity or action influences our future perception of capabilities. We are starting to learn that human beings use prediction based on past experiences to navigate the uncertain nature of the world around them. If we have been successful at something in the past then it is likely we will perceive that we can overcome it again. This is also related to the ease of the successes. If our successes have being easy then we maybe quickly dissuaded by obstacles. If the successes have been tough then we may also be used to overcoming any obstacles that come our way. In line with this view we see that previous adherence and participation in exercise has been shown to be important in future exercise adherence HERE. The world around us also influences our perception of capabilities. If people surround you that you perceive as similar, who are achieving similar things that you are being required to achieve, then you will also be more likely see these things as attainable. This could be from the media that we consume to the involvement in social activities or our family circle, this underlines the social aspects of pain that appear to be pretty important. Now this can be both positive and negative, and of course it is easier to be influenced negatively than positively! But those that are persuaded, both verbally and experientially, that they are capable of achieving a task are more likely to be able to do so especially if we see previous success as a key factor. Strong negative feelings towards an activity or the negative perception around an activity also will influence the level of self efficacy someone has. Self doubt is often an emotion that influences behaviour negatively. So we have to also ask, why is it important? It appears that self efficacy has been linked in multiple papers to worse outcomes across various measures of pain and disability. Now we cannot suggest it is causative or even that improving it will simply improve outcomes at this moment in time. But if I were to go out on a limb I think it probably would : ), especially if we are promoting more active approaches to therapy. Certainly exercise as a treatment relies on it being performed and evidence based medicine falls flat on its face if we cannot apply the treatment to the patient. Foster, in 2010, found that for people with low back pain, low confidence in their ability to perform normal activities, or low self efficacy, was predictive of a worse outcome in terms of disability at 6 months, in fact better than fear avoidance, catastrophising or depression HERE. Keedy, 2014, found that those without the ability to engage in pain management related behaviours, pain self efficacy, is related to the outcomes for back pain rehabilitation HERE. Greater passive behaviour scores were also found to be associated with worse outcomes at a five year follow up for lower back pain by Chen, 2018 HERE. Passive coping strategies rely on external resources for pain control rather than internal resources such as our belief systems HERE that also influence self efficacy. Self efficacy has also shown to be fundamental to the adherence of exercise interventions. These studies found that low self efficacy was a predictive factor for poor adherence to a home exercise program HERE & HERE. For all the focus on the nuts and bolts of exercise, it is a pretty redundant process if the person does not feel capable of doing it. Time spent in this area rather than a focus on sets and reps may drastically improve adherence and therefore outcomes. What can we do to alter it? The first steps may simply be to create a successful experience! Previous successful adherence and progress have been associated with increased self efficacy and this ties in with a Bayesian perspective of human function. So perhaps our aim for those that display low self efficacy should be to set a low threshold for activity that can lead to easy adoption and fast progress. We often aim for a dosage of activity that leads some kind of physical overload and adaptation. This could potentially lead to a negative experience for some and limit increased participation, without a positive initial experience they may not achieve longer term sustainable success. So essentially good for psychology but not so much for physiology in the short term but hopefully leading to greater longer term physiological impact through sustained participation. It could be that just making an exercise session fun and not boring could be a very beneficial outcome. We often don’t place much importance on these things within medicine though. Why do people play sports? Maybe because they enjoy other aspects beyond just the physical exertion component. People are often driven by challenge, fun & competition, how often do you incorporate these aspects into your training? Motivation also appears to be a key aspect to self efficacy. Helping people find something that actually motivates them could also be important and this could be through a goal setting process that identifies valued activities. We could then break it down into more perceived manageable chunks that create little wins to help motivate the person. I call this helping them find their ‘why’. 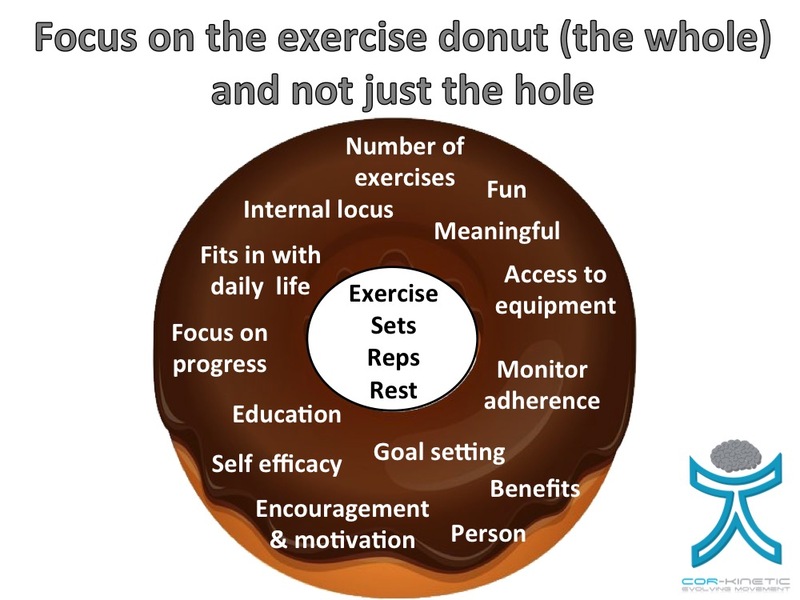 Lots of exercise programs don’t resonate with people, especially if they have not really participated in one before so exercise in itself is not enough of a ‘why’ for them. We might ask “what would your perfect day look like with regards to activity?” or “what are some things you love to do that you don’t or can’t?”. Autonomy is another factor factor associated with successful exercise, HERE , so also giving choices and options rather than a 'this is the exercise you have to do' approach. Sitting down and planning with people when they might do things and how much might also have an impact on self efficacy. Being able to do this for themselves might be a limiting factor and the participation in activity may feel like too great a challenge without some guidance. What days might be best? What kind of effort level? Set a reminder on the smart phone? Alternative options if you do not succeed?